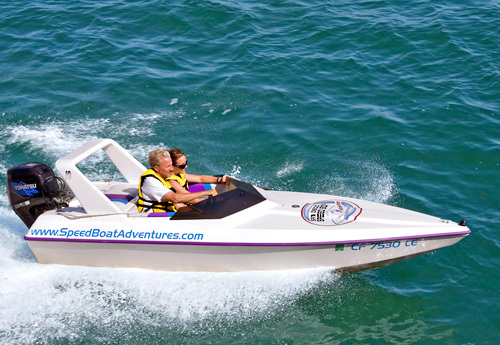 Offering a unique guided and narrated tour of the St. Petersburg and Tampa Bay areas, the Speed Boat Adventure Tour lets guests be the captains of their very own speed boats, allowing them to navigate themselves under the guidance of professionally trained guides. The tours include hilarious educational narration, as well as up-close views of dolphins, manatees, sea birds and more. 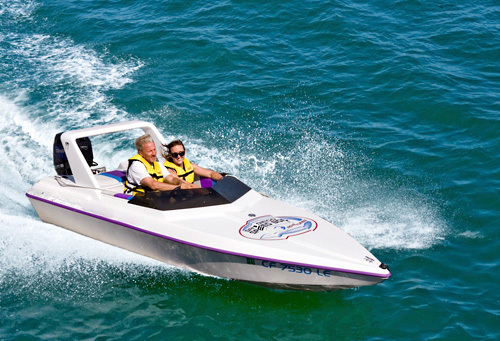 Experience the thrill of captaining your own speedboat. See dolphins, manatees and birds. Must be 18 years or older to drive a boat. Per boat weight limit of 500 lbs. Drivers can switch during tour. One of the best things to do when in Tampa or St. Petersburg Beach! Experience the adventure of a lifetime on our Speed Boat Adventure Tour. A guided and narrated tour of the St. Petersburg waterways and Tampa Bay…with a twist. You are able to navigate and captain your own speedboat for the entirety of the tour while following our trained guides to experience the best of both worlds – the THRILL of driving your own speedboat, and the safety of having a skilled guide introduce you to the beauty of Tampa Bay and the St. Petersburg waterways. The witty yet historical narration is done through a radio communication system mounted in each boat. Spot dolphin, manatee, sea birds, and more! Reservations are fully refundable up to 7 days prior to departure. WEATHER POLICY: Occasionally a trip will be affected by unexpected clouds or inclement weather. We assume no responsibility for nor do we have any control of the weather in the area. We endeavor to be well studied and to make well informed go/no-go decisions but no refunds will be given should the resulting conditions become unfavorable. Are there any restrictions or weight requirements? Yes, there is a per boat weight limit of 500 lbs. A small child (under 50 lbs) is allowed to sit in the middle. You must be 18 years or older to drive a boat by yourself. Absolutely! We will stop several times during the tour and you can switch drivers if you like. No problem! Our boats are very simple to operate and we will make sure you are fully comfortable with the operation before we leave the dock. If we have another single on your tour then we will pair you together and you can make a new friend (or love connection). If not then you get the boat to yourself.